This article is about bookmaking in the sense of gambling. For other uses, see bookmaker (disambiguation). For other uses of "bookie", see bookie (disambiguation). Bookmakers in many countries focus on accepting bets on professional sports, especially horse racing and association football (soccer). However, a wider range of bets, including on political elections, awards ceremonies such as the Oscars, and novelty bets are accepted by bookmakers in more and more countries. By "adjusting the odds" in their favour (paying out amounts using odds that are less than what they determined to be the true odds) or by having a point spread, bookmakers aim to guarantee a profit by achieving a 'balanced book', either by getting an equal number of bets for each possible outcome or (when they are offering odds) by getting the amounts wagered on each outcome to reflect the odds. When a large bet comes in, a bookmaker may also try to lay off the risk by buying bets from other bookmakers. Bookmakers do not generally attempt to make money from the bets themselves but rather by acting as market makers and profiting from the event regardless of the outcome. Their working methods are similar to those of an actuary, who does a similar balancing of financial outcomes of events for the assurance and insurance industries. Depending on the country, bookmaking may be legal or illegal and is often regulated. In the United Kingdom, since 1 May 1961, bookmaking has been legal and has even been a small contributor to the British economy, with a recent explosion of interest with regard to the international gaming sector industry. However, gambling debts were unenforceable under English law until the Gambling Act 2005. Many bookmakers are members of IBAS, an industry organisation used to settle disputes. Bookmaking is generally illegal in the United States, with Nevada being an exception due to the influence of Las Vegas. In May 2018, a United States Supreme Court ruling struck down the Professional and Amateur Sports Protection Act of 1992, which prevented individual states from legalizing bookmaking. In some countries, such as Singapore, Sweden, Canada, and Japan, the only legal bookmaker is owned and operated by the state. In Canada, this is part of the lottery programme and is known as Sport Select. The first bookmaker in the United Kingdom is considered to be Harry Ogden, who opened a business in the 1790s, although similar activities had existed in other forms earlier in the eighteenth century. Following the Gaming Act 1845, the only gambling allowed in the United Kingdom was at race tracks. The introduction of special excursion trains meant that all classes of society could attend the new racecourses opening across the country. Cash concentrated towards the bookmakers who employed bodyguards against protection gangs operating within the vast crowds. Illegal betting shops were fined, but some, like Bella Thomasson, ran betting businesses that the police appeared to turn a blind eye to. In 1961, Harold Macmillan's Conservative government legalised betting shops, with tough measures enacted to ensure that bookmakers remained honest. A large industry has grown since. At one time, there were over 15,000 betting shops. Now, through consolidation, they have been reduced to between 9,100 and 9,200 in 2013. The group of the largest bookmakers in the country, known as the "Big Three", comprises William Hill, Ladbrokes, and Coral. Improved TV coverage and the modernisation of the law have allowed betting in shops and casinos in most countries. 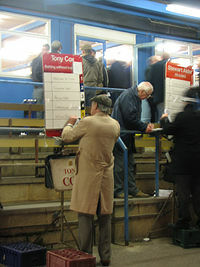 In the UK, on-track bookies still mark up the odds on boards beside the race course and use tic-tac or mobile telephones to communicate the odds between their staff and to other bookies, but, with the modernisation of United Kingdom bookmaking laws, online and high street gambling are at an all-time high. A so-called super-casino had been planned for construction in Manchester, but the government announced that this plan had been scrapped on 26 February 2008. Although online gambling first started in 1994 when the licensing authority of Antigua and Barbuda passed the Free Trade & Processes Act, bookmakers did not get involved until 2001. They were forced to act when research at the time found there were eight million online players worldwide. With the arrival of the World Wide Web, many bookmakers have an online brand, but independently owned bookmakers often still maintain a "bricks and mortar" only operation as the software and hardware required to operate a successful online betting operation are complex and their costs are quite prohibitive; other bookmakers operate "skins" or "white label" websites, which they purchase from one of the large firms. The main websites require bets to be from countries where Internet gambling is allowed and from people over 18 years old. Some small bookmakers and startups purchase software from specialised white label solution providers. Since gambling products have a high conversion rate from one niche to another, most online betting websites also feature other gambling products such as poker, live dealer casino games, lottery, bingo, slots and other casino games. Controversially, the explosion in Internet gambling is being linked to a rise in gambling addiction, according to the UK's help and advice organisations for addicts, GamCare and Gamblers Anonymous. Increasingly, online bettors are turning to the use of betting exchanges such as Betfair and BETDAQ, which automatically match back and lay bets between different bettors, thus effectively cutting out the bookmaker's traditional profit margin also called an overround. These online exchange markets operate a market index of prices near but usually not at 100% competitiveness, as exchanges take commissions on winnings. True wholesale odds are odds that operate at 100% of probabilistic outcomes. Betting exchanges compete with the traditional bookmaker. They are generally able to offer punters better odds because of their much lower overheads but also give opportunities for arbitrage, the practice of taking advantage of a price differential between two or more markets. However, traditionally, arbitrage has always been possible by backing all outcomes with bookmakers (dutching), as opposed to laying an outcome on an exchange. Exchanges, however, allow bookmakers to see the state of the market and set their odds accordingly. With the increasing number of online betting exchanges, betting exchanges are now providing free bet offers in an attempt to lure customers away from the competition. These free bets are generally based on the size of the deposit made into the gambling account. For example, if a customer made a deposit of $20, the betting exchange would deposit an additional $20 for the customer to use. Free bet rules vary depending on the betting exchange. Some bookmakers have even taken to using betting exchanges as a way of laying off unfavourable bets and thus reducing their overall exposure. This has led to insecurity from some TABs in Australia, state-run betting agencies that attempted to deny Betfair an Australian licence by running unfavourable ads in the media regarding the company. When Tasmania granted Betfair a licence despite these efforts, the Western Australian state legislature passed a law that specifically criminalised using betting exchanges from within the state; however, the law was later ruled to be unconstitutional. Bets are also taken via phones, using email and SMS text messages, though poker and other sports are more suited to other media. As technology moves on, the gambling world ensures it is a major player in new technology operations. Most televised sports in the United Kingdom and the rest of Europe are now sponsored wholly or partly by Internet and high street bookmakers, with sometimes several bookmakers and online casinos being displayed on players' shirts, advertising hoardings, stadium signs and competition event titles. Sponsors are especially highlighted in the football category since football fans present a significant percentage of the target group the bookmakers serve. Many of the bookmakers are sponsoring some of the major football teams in the major European football leagues, although Werder Bremen are currently fighting the German courts for the freedom to continue featuring bookmaker Bwin on their shirts, as Germany and France take action against online gamers. With the recent banning of tobacco sponsorship and the significant commercial budgets available to the gaming industry, sponsorship by car manufacturers, alcoholic drinks, soft drinks and fast-food marketers is being rapidly replaced by sponsorship from gaming companies in the Far East and Europe. The United Kingdom's Gambling Act 2005 introduced a new regulatory system for governing gambling in Great Britain. This system includes new provisions for regulating the advertising of gambling products. These provisions of the Act came into effect in September 2007. It is an offence to advertise in the UK, gambling that physically takes place in a non-European Economic Area (EEA) or, in the case of gambling by remote means, gambling that is not regulated by the gambling laws of an EEA state. The situation is more confused in the United States, which has attempted to restrict operators of foreign gambling websites accessing their domestic market. This resulted in 2007 in a ruling against the US government by the World Trade Organization. ^ Barrett, Norman, ed. (1995). The Daily Telegraph Chronicle of Horse Racing. Enfield, Middlesex: Guinness Publishing. p. 10. ^ Munting, Roger (1996). An Economic and Social History of Gambling in Britain and the USA. Manchester University Press. p. 89. ^ Vamplew, Wray; Kay, Joyce. (2005). Encyclopedia of British Horseracing. Routledge. p. 50. ^ "Thomason, Ann Arabella [known as Bella Thomasson] (1874–1959), bookmaker | Oxford Dictionary of National Biography". doi:10.1093/ref:odnb/9780198614128.001.0001/odnb-9780198614128-e-56685 (inactive 2018-06-09). ^ Vamplew and Kay, p. 51. ^ "A history of online casinos: infographic". rightcasino.com. ^ "The Most Common Sportsbook Bonus Types". Retrieved 24 August 2014. ^ "Betfred.com Chooses OtherLevels' Platform to Power Their Mobile Marketing Campaigns". Market Watch. 28 July 2014. Retrieved 24 August 2014. ^ "A Look At Bookmakers Sponsoring Football Clubs". ReliableBookies.com. 2013-03-19. Retrieved 2013-03-19. ^ Holman, C D'Arcy; Donovan, Robert; Corti, Billie; Jalleh, Geoffrey; Frizzell, Shirley; Carroll, Addy. "Banning tobacco sponsorship: replacing tobacco with health messages and creating health-promoting environments". The British Medical Journal. Retrieved 24 August 2014. ^ "WTO rules against US gaming ban". BBC News. 30 March 2007. Retrieved 1 September 2011.